New York City in the 1980s was a mesmerizing, wild place. A hotbed for hip hop, underground culture, and unmatched creative energy, it spawned some of the most significant art of the 20th century. It was where Jean-Michel Basquiat became an avant-garde street artist and painter, swiftly achieving worldwide fame. During the years before his death at the age of 27, he shared his life with his lover and muse, Suzanne Mallouk. A runaway from an unhappy home in Canada, Suzanne first met Jean-Michel in a bar on the Lower East Side in 1980. Thus began a tumultuous and passionate relationship that deeply influenced one of the most exceptional artists of our time. In emotionally resonant prose, award-winning author Jennifer Clement tells the story of the passion that swept Suzanne and Jean-Michel into a short-lived, unforgettable affair. 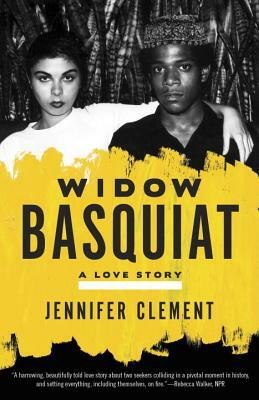 A poetic interpretation like no other, Widow Basquiat is an expression of the unrelenting power of addiction, obsession and love. Jennifer Clement studied literature in New York and Paris. She was awarded the NEA Fellowship for Literature and the Sara Curry Humanitarian Award for her most recent novel, Prayers for the Stolen. Formerly president of PEN Mexico, she currently lives in Mexico City.